Have taken it easy today. 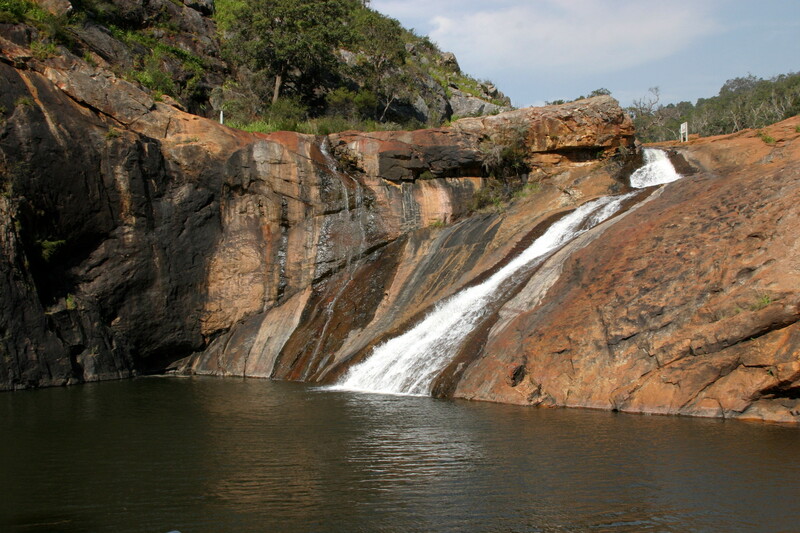 Just a gentle drive up to the Elizabethan Village Pub for lunch followed by a trip up to Serpentine Falls. Elizabethan Village Pub is the nearest thing I have seen to an English pub in terms of appearance and atmosphere.The food was delicious. My wife and I both had Black Angus Sirloin Steak while my daughter and her husband both had Grilled Barramundi Fillets topped with Creamy Garlic Prawns. Top grub. The pub is also home to the Last Drop brewery and we sampled their Thunderstorm brew, an unfiltered pilsner. They have other brews too, however as I was driving I couldn’t sample them. They all appear to be around 4.8% ABV. We’ll just have to go back again when someone else is in the driving seat. As I said we also took a run up to Serpentine Falls. We thought, given the amount of rain Perth has experienced recently, that the falls would be running quite high and hard. I have been there before and the flow didn’t seem any higher than our previous visit. I’m guessing that the dam, upstream, is retaining as much water as possible since W.A. does have a water problem and they like to retain as much as possible. On the entrance road to the falls there is a picnic area and we noticed a number of Kangaroos. Each and every one of them appeared to be carrying a joey. Most appeared to have clambered into mums pouch head fist and had their hind legs hanging out. All barring one, who had his head out and was feeding himself from the comfort of mums pouch. Sorry I have no pictures as I didn’t feel it was right to intrude so we just kept the car rolling. After the fresh air and nature watch the girls felt in the need for some retail therapy so we headed into Armadale where the girls perused the various clothes stores. Following a cup of tea we headed home to relax for the rest of the evening. Needless to say, after a very filling lunch, none of us was up for anything to eat for tea so relaxed with a beer and some nibbles. This entry was posted in Food, Travel, Wildlife and tagged Armadale, Barramundi, Black Angus Sirloin Steak, Elizabethan Village Pub, food, joey, Kangaroo, Martin Pot, Prawns, Serpentine Falls. Bookmark the permalink.